Is poetry a way of knowing? And if so, what, exactly, does it know and not know? Can poetry approach Mystery without attempting to flush it like a rabbit into the light of common thought? Should poetry stalk Mystery, leap upon its fleeing back, and take it down, like prey? Ron Houchin’s Among Wordless Things, published by SAWC member Charlie Hughes (Wind Publications, 2004) and winner of the 2005 Appalachian Writers Association’s Poetry Book of the Year Award, fronts these questions. Appropriately, and humbly, it answers by not finding many answers. 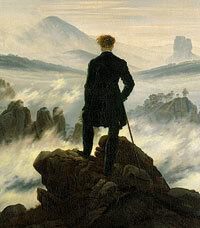 There’s something in the consciousness of the book that I find also in Caspar David Friedrich’s early 19th century painting “Wanderer Above The Sea of Fog.” The same solitude among the wordless things of mist, mountain, landscape, sky--all metaphors of uncertainty-- and the same willingness to live powerfully in mystery with confidence and attentiveness. [passing] in random fashion through an imaginary place above the forest canopy...intercepted by leaves and twigs and channeled into distinctive vert space patterns of through-drip, crown-drip, and stem flow. The soil surface, as receiver, transmits the ‘rain message’ downward, but as the subsoils lack a power source to mold a flow design, the water tends to leave the ecosystem as it entered it, in randomized fashion. If we are up against mystery, then knowledge is relatively small and the ancient program is the right one: Act on the basis of ignorance. Acting on the basis of ignorance, paradoxically, requires one to know things, remember things--for instance, that failure is possible, that error is possible, that second chances are desirable (so don’t risk everything on the first chance) and so on...Both the Greeks and Hebrews told us to watch out for humans who assume that they make all the patterns. We think once more of Hamlet. When at last he realizes the futility of trying to reason out every detail of his plan for revenge--and the revelation of knowledge, too, since avenging his father will involve outing the guilt of King Claudius--he wisely accepts that despite all his painful struggle and deliberate plotting and counter-plotting, “there’s a divinity that shapes our ends,/rough hew them how we will.” In other words, Mystery prevails, even in the most intensely considered situations; and often the best and only we can do is to “let be.” That means, in the case of the poet, to try in humility to name the nameless, to voice the voiceless, to word the wordless, all the while knowing that it is only possible, perhaps, by indirection, which is to say, by metaphor. This is the heart of poetry and tragedy isn’t it? That the unknowable exists and exerts a massive power in the universe, that humans are ultimately not in charge, that the universe has ways that can’t be altered, ways that sometimes destroy us even while we exalt in our power over them. This is not predestination, not randomness, but an acknowledgment of what Wordsworth refers to as “the burden of the mystery” that all who are in touch with life’s ways come to acknowledge. Accepting the limits of understanding may be taxing to the scientist, but to those aware of the universe’s edges of mystery (in Hamlet, death is the Ultimate Mystery, that “undiscovered country from whose bourn no traveler returns"), confronting such an edge is understood to be the way of life. And to some, there is an exhilarating quality to such awareness. There is much we do not know. Yes! Good news! There is a wilderness out there, unreachable, some of it possibly grand and beautiful, that we might never foul with our consciousness, spoil with our ignorant tinkering, conquer with our aesthetic of ugliness and power. Or, to put it other terms, one of the rewards of Heaven might be to learn those things we could not learn in life. And so the “wordless things” that Houchin dwells among in these poems exist at the edges, beyond the borders, just outside the windows of these poems and just beyond the bourn of certainty. I remember a night I spent in Ron’s house a few years ago, after a reading we gave at Marshall University. He gave me his bedroom--a place long unoccupied since he had taken up residence in another part of the house--with a listing, longboat-sized bed butted athwart a bank of leaky windows overlooking the Ohio River. As I lay there trying to get to sleep, the sounds of the factory directly across the river sifted through the room, and the searchlight of a towboat struggling upriver flashed across the walls. What a strange world there was, just a few inches beyond the top of my head. It was as mysterious to me, once more, as it had been to me as a boy, a hundred miles upriver, hearing the same factory sounds, the same dull moans of tows on the river, the downshifting coal trucks in the hills. In the place between sleeping and waking where I suspect the most accurate perceptions of life sometimes occur, Mystery is king. This is why Houchin approaches the subjects of his poems with humility, gravity, and sometimes with a wry, survivor’s humor. Using the only thing a poet has--words (we’re reminded of the dilemma of Rosencrantz and Guildenstern in Tom Stoppard’s play, “Words--they’re all we have to go on” ) Houchin faces the facts of the matter, which in his vision, includes the greatest fact, Mystery. And words, shifty and haunted with meaninglessness, are the only things he has to go on. suddenly the room will fill with dogwood. But there is something indecent in me. trapped in the depths of a hollow elm. and an open knothole teasing that I can climb out. Language and its way of meaning, its grammar, in other words, goes away, transformed into something else--something wordless, something filled with oddly teasing holes, inescapable, wordless emptinesses. Besides the literal last image of the knothole, look how many words in these lines contain the “o” of holeness, of emptiness, of silence-- and of perhaps, an objective correlative for the emotional tone of Edvard Munch’s “The Scream”: wood, point, prepositions, apostrophes, of, room, dogwood, something, month, moon, look, hollow, above, only, of, old, wood, open, knothole, out. Now look at the first poem in the book: “The Hole.” It “waits as if for the right something,/but darkness is its common lover.” Later, the speaker says, “Back in bed, I’ll think of holeness.” And sure enough, there’s a poem entitled “The O’s.” The emptiness that lurks, its great entrance open like the “O” of an old cistern--this is what throughout the book collects and gathers the poet’s consciousness and unconscious, and it is both a gathering cistern, and a guiding conduit, perhaps even a sewer, both a way of communicating and connecting and a way of disposing forever--and it might also be a well, which may be life-giving, or may run dry, emptied, returning to mere holeness. Or it might be the opening of the uterus, for the tooth-mother lurks in these poems, too. Or it might be the yawning grave. or in church windows between stars. There are your fast-pounding feet. and you’ll hunt joy somewhere else. Right. Maybe the answers will come, but more often they will not. Thought will not answer. “Let be.” For in the great hunt for meaning, often we’re all left holding the bag. And, as this elusive, attractive, post-modernist collection might have asked, what is a bag but a hole wearing clothes?